Venezuela. Propaganda war being waged against Hugo Chavez. Venezuelan leader never accused U.S. of launching an earthquake weapon against Haiti. Chavez was erroneously connected to a story on the Internet penned by "Sorcha Faal," a notorious Internet hoaxer whose is also known as David Booth. Booth/Faal normally claims to be funneling information from Russian government sources. 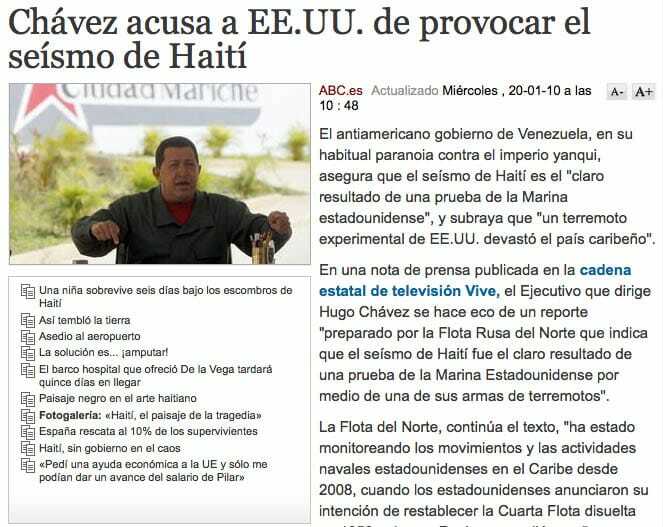 On January 19, Spanish newspaper ABC, a newspaper of record in Spain, published a story entitled "Chavez Accuses US of Causing Earthquake in Haiti." The story was quickly picked up by websites around the globe -- most quoting Venezuelan president Hugo Chavez as saying the U.S. used a new tectonic weapon to induce the Haitian earthquake. This was, according to Chavez -- "only a drill, and the final target is destroying and taking over Iran." Within the actual story, ABC noted that the information came from an obscure opinion post on the website of a Venezuelan state television channel, VIVE Television. The post referenced a supposed Russian military report on American seismic weapons. All quotes subsequently attributed to Chavez regarding Haiti and earthquake weapons were in fact direct quotes from this web posting -- none of which was ever uttered by Chavez. Spurred on by the international attention being received by its first story, ABC posted a second article on January 20 under the banner "The Secret Weapon to Cause Earthquakes" in which it cites Chavez as having blamed the US for razing Haiti. By the time the story had run its course, it had been covered with varying degrees of accuracy by corporate news channels, foreign outlets eager to accuse the U.S. of another evil deed, and conspiracy websites happy to have their ideas officially validated. In the end, it serves as one more reminder to those who prefer truth over ideological delusion: there are some subjects for which the myths of journalistic standards will still be displayed -- stories about the government of Venezuela are not one of those subjects. This article was first published by The Anti Press on 22 January 2010; it is reproduced here for non-profit educational purposes. Vea también: "Otra mentira de la prensa derechista: Chávez se suma a la teoría conspiranoica del HAARP" (libreXpresion.org, 20 Enero 2010). kelly's murder, raison d'etat: 70 years secret! biofuel genocide, 25% of us grain for cars! grippe a: l'oms laquais des "pharmaciens"